Sat., April 23, 2016, 3:54 p.m.
For information on Chabad Lubavitch of Idaho, visit www.jewishidaho.com. As the sun went down Friday evening, candles were lit and blessings were spoken in a conference room at La Quinta Inn and Suites in Coeur d’Alene, where a small group of Jews gathered on the first night of Passover. Led by two Orthodox rabbinical students, the group took part in a three-hour seder meal commemorating the liberation of the Israelites from slavery in Egypt. Friday’s dinner is believed to be the first publicly announced Jewish seder in Coeur d’Alene. The ancient story of suffering and deliverance resonated with participants, some of whom recalled North Idaho’s past as the headquarters for the Aryan Nations, a white supremacist group. The dinner was organized by Boise-based Chabad Lubavitch of Idaho, which has been sending rabbinical students to North Idaho since 2004 as part of an outreach to Jewish families. “They’ve only had pleasant experiences,” said Rabbi Mendel Lifshitz, director of Chabad Jewish Center in Boise. The Aryan Nations were a “small but shrill” group, who didn’t represent the greater population of North Idaho, he said. The Aryan Nations lost their 20-acre Hayden compound through a 2000 bankruptcy. The founder, Richard Butler, died in 2004. But DaSilva said she knows people who are still hesitant to talk publicly about being Jewish for fear of attracting trouble. “We have to be able to have freedom of religion,” she said. Chabad Lubavitch is an Orthodox Jewish movement known for its outreach efforts. In areas with small Jewish populations, the movement organizes events to connect Jews with other Jews. Plotkin and his colleague, Sholom Dubov, arrived in Coeur d’Alene on Wednesday with 80 pounds of kosher food for the dinner. 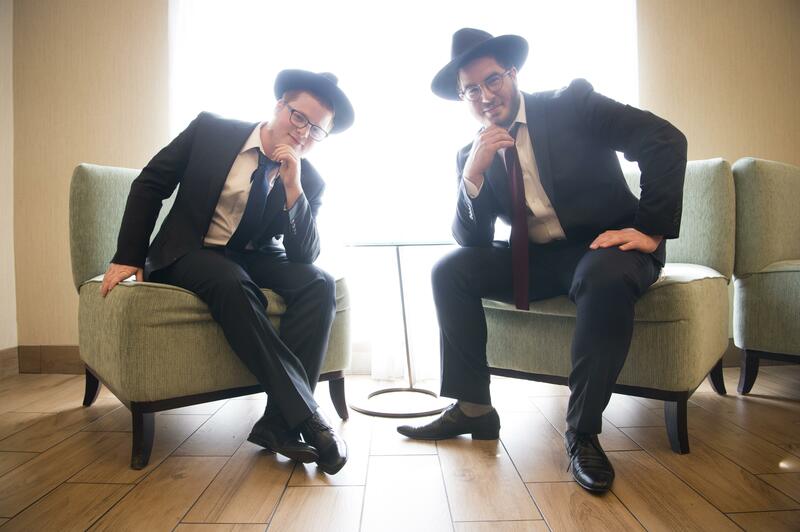 The men, both 19, are nearing the end of their training at the Rabbinical College of America, headquartered in Morristown, New Jersey. As part of the two-day preparation for the seder, the men preformed a ritual washing of pots and pans in Lake Coeur d’Alene, attracting bystanders’ attention for wearing their traditional black hats with swimming trunks. Seders take place on the first two nights of the eight-day Passover celebration. The story of the Israelites’ exodus out of Egypt is told with questions and answers, readings, singing and food. “Why is this night different from all other nights?” is one of four questions asked during the seder. On Friday night, Plotkin recited the question in Hebrew, English and Yiddish. Seder participants ate horseradish and vegetables dipped in salt water during the dinner, remembering the bitter tears shed by the Israelites during their suffering as slaves. They also ate unleavened bread, known as matzo, recalling how the Israelites fled Egypt before the bread had time to rise. And they drank glasses of wine or grape juice, representing the cup of freedom. By eating Passover foods, “we are not just commemorating this, we are reliving it,” Dubov said. The story of slaves becoming a free people is still relevant today, the rabbinical students said. During Passover, Jews reflect on the struggles in their lives and search for ways to break out of exile, “growing to be better Jews and better people,” Dubov said. Norman Leffler, a retired physician, took part in the community seder, which drew both Jews and non-Jews. Leffler grew up in New York and lived in Florida before moving to North Idaho. He finds it “stimulating and interesting” to get together with other people of Jewish heritage. The story of Passover, with its celebration of freedom, is one for the ages, Leffler said. “Next year, in Coeur d’Alene,” Plotkin added. Published: April 23, 2016, 3:54 p.m.